Sinuses are a common problem in the United States, affecting between 10 and 30 percent of Americans. But many people may be surprised to know how much sinuses can affect your overall health and well-being. They play a major role in your breathing, smelling, and clarity. At Detroit Sinus Center, our sinus doctors are committed to providing our patients with the highest quality care and treatment for sinus pain and pressure. Our board-certified specialist and sinus doctor, Dr. Lascelles Pinnock offers a variety of specialized treatment options, including servicing Detroit, Dearborn, Allen Park, and Southfield with balloon sinuplasty. Schedule a consultation with our sinus doctor today and get the relief you need. Maxillary Sinuses: These are in the cheekbones and the largest of the sinuses. Frontal Sinuses: These are in the low center area of the forehead. 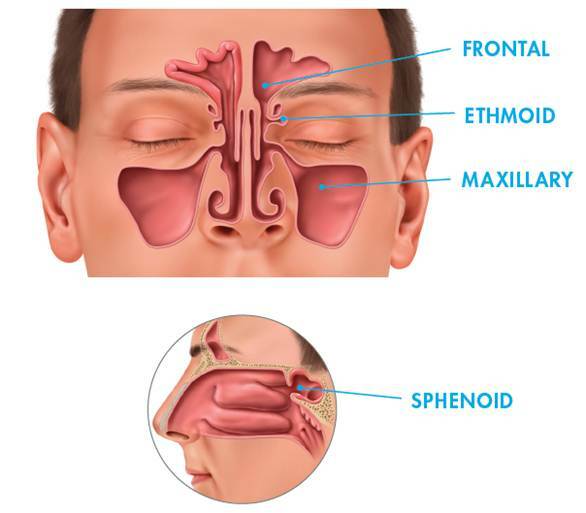 Ethmoid Sinuses: These are on the nasal bridge, between the eyes. Sphenoid Sinuses: These are behind the nasal cavity, in between bones. Each time you breathe, the air that comes in is humidified with mucus in the sinuses, collecting pollutants and bacteria. The tiny hairs that line the sinuses move the bacteria and pollutants with the mucous into the throat. Once you swallow, the acid in your stomach destroys the pollutants. Dr. Pinnock can provide a consultation to determine the best course of action for your sinus problems. We specialize in providing Detroit, Allen Park, Dearborn, and Southfield balloon sinuplasty and other minimally invasive procedures to bring you optimal comfort and healing. Schedule a consultation today. To discuss treatment options for sinus pain and pressure give Detroit Sinus Center a call today. We specialize in a variety of treatment methods including Detroit, Dearborn, Allen Park and Southfield balloon sinuplasty. Give us a call today at either of our convenient locations: Allen Park (313) 449-8871 or Southfield (248) 327-3344.